I woke up at 4:30AM this morning to watch USA vs Slovakia men’s hockey. That’s no problem. I’ve woken up early for games before so this was nothing new. Plus, I’m used to being up early. But I was a little sleepy and in watching the game, I encountered a problem that I know other people had too: the teams had very similar uniforms. Since all the hockey jerseys are made by Nike, several have similar template designs. 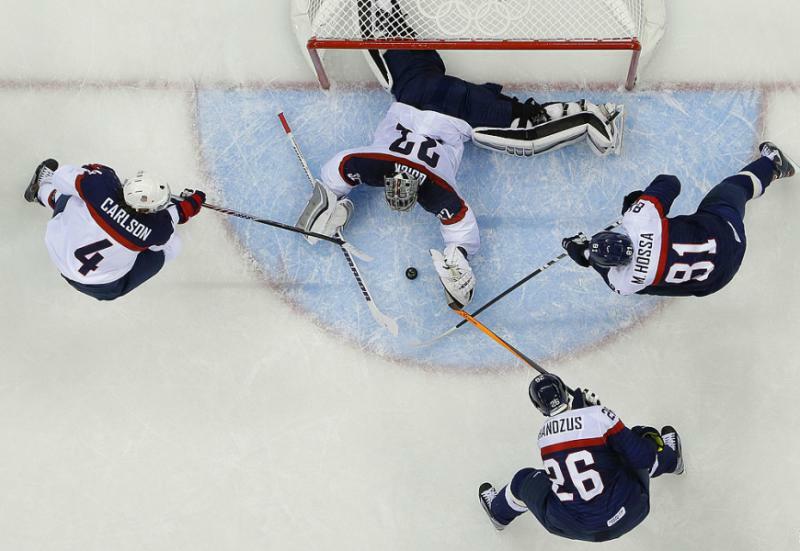 Because of that, I had to constantly remind myself that USA was wearing white since both teams had the exact same color scheme. Looking at Slovakia, they could easily be mistaken for the USA team. After each USA goal, I had to do a double take to make sure I knew which team wearing red, white and blue scored. Other teams have distinct enough designs, which is good. This is the problem when the same manufacturer sacrifices creativity and just outfits everybody with the same template. Fortunately, this confusing matchup is unlikely to surface again in the Olympics. But still, can Nike get a little creative? This entry was posted in Olympics, Outfitters, Uniforms & Design and tagged Nike, USA Hockey. Bookmark the permalink.